A Toast – To You! Holy crap, second place, you guys!! Sorry, I just had to get that out! 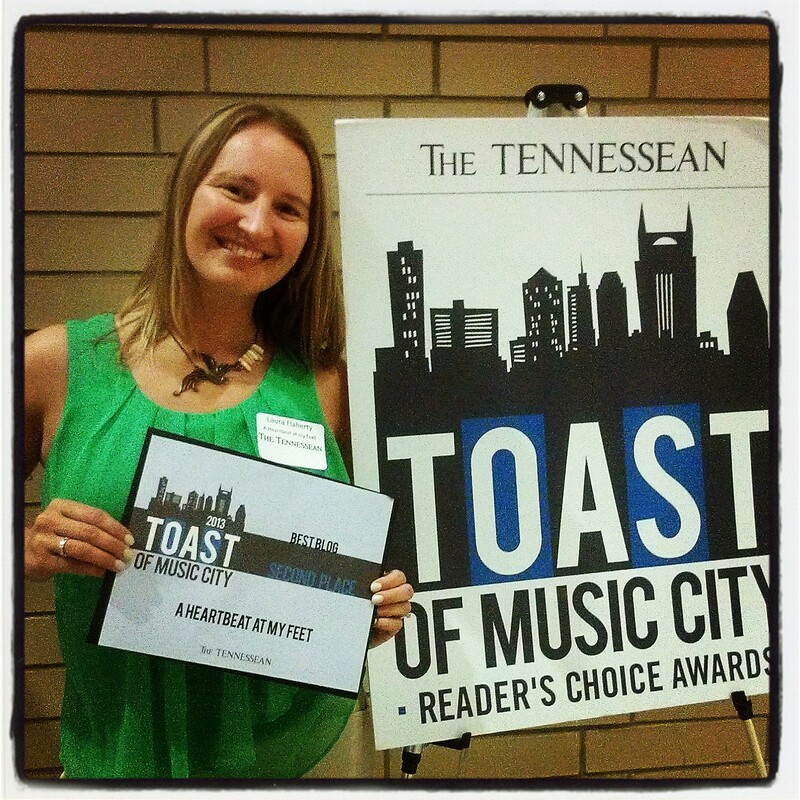 Let me back up a bit…back in June, Foster Dad and I found out that our lil’ old corner of the interwebs was nominated for The Tennessean’s annual Toast of Music City Reader’s Choice Awards for Best Blog. The nomination alone blew us away. 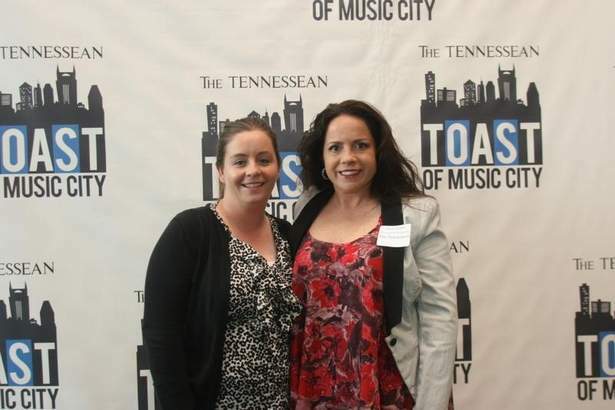 The Tennessean is the go-to print news source for Nashville and our surrounding counties. 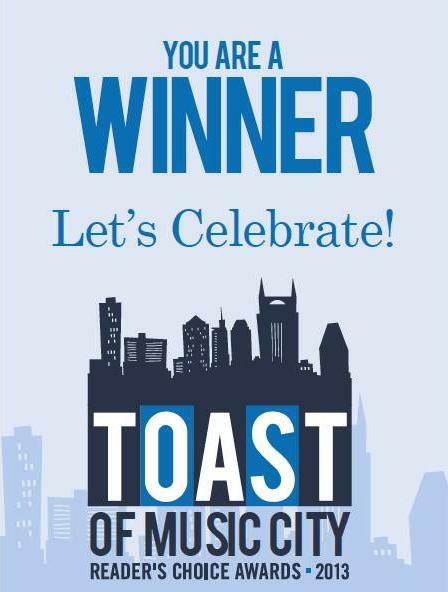 They host the TOMC awards every year, in which Nashvillians get to vote on their favorite of their favorites in every category from restaurants, home improvement providers, retailers, local celebrities – just about everything that makes living in Nashville awesome. I couldn’t believe it! Second place?? 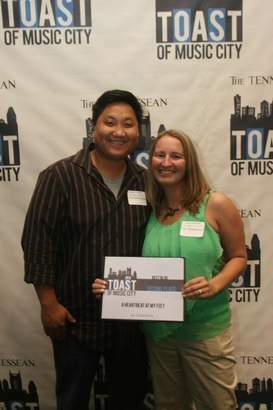 Of the dozen or so blogs that were nominated, we won second?? 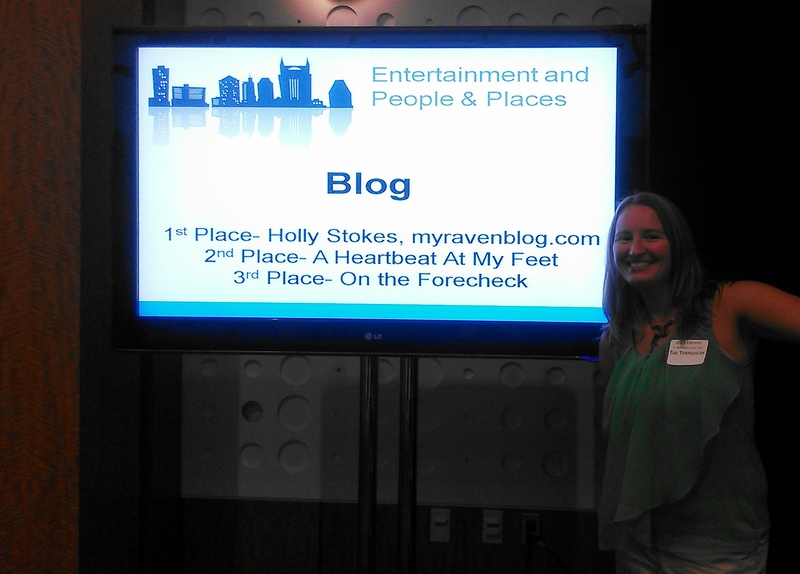 After less than two years in the blogosphere, second place? Second? Seriously? Could. Not. Believe. It. Best Local Artist (visual): Amiee Stubbs Photography (2nd place). Amiee is the photographic genius behind Kaylee’s adoption photos and the Impression-a-Bull project, and is also the gal behind the lense at all of Animal Rescue Corps’ large scale rescue operations. She rocks so hard. Lauren Revans and Amiee Stubbs, from Amiee Stubbs Photography. Serious awesomeness, right here! 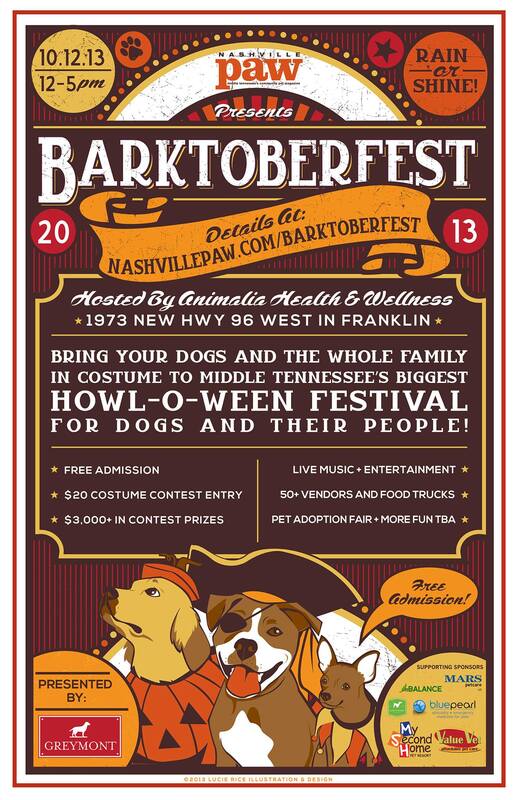 Best Festival: Barktoberfest (3rd place). Nashville loves our festivals, that’s for sure – that is to say, we have lots of ’em! 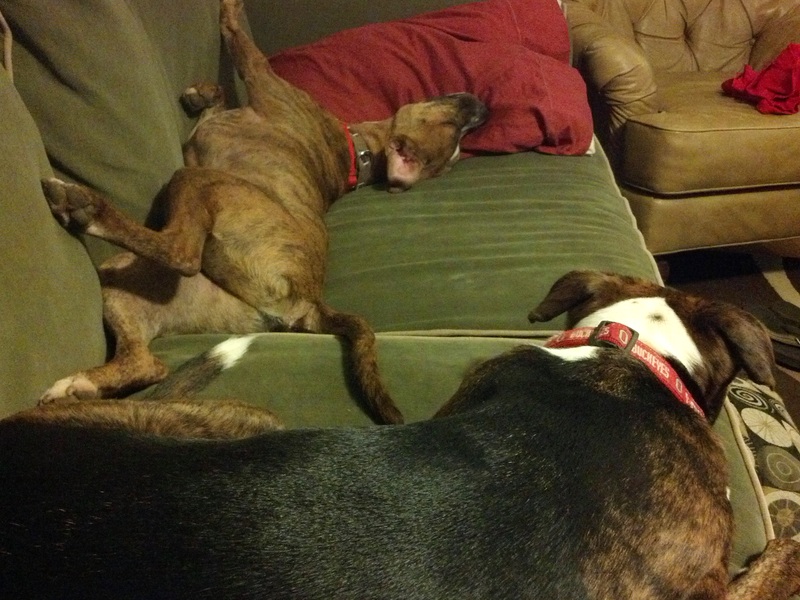 And for one of Nashvillian’s favorites to be dog-centric is pretty dang cool. This year’s event is on October 12th and admission is free, so mark your calendars! Best Hotel: Loews Vanderbilt (2nd) and the Hutton Hotel (3rd place) are both dog friendly and were recent hosts to Agape Animal Rescue‘s annual fundraiser, Glitter & Glam. A million-squillion thanks go to everyone who voted for us this year. Second place ain’t too shabby, and we are so, so honored. This award means so much to us because it means that there are real live people out there behind our blog stats who are actually reading this thing, and are totally into the antics of our foster dogs, tips and tricks of owning and caring for pets, news about large scale rescues, and whatever random stuff crosses our minds. So, here’s to you readers! Thank you, from the bottom of our hearts for sticking with us. You are amazing! Oh, and a super special thanks goes out to local celebri-dog and runway model, Willie Fitzgerald, for the nomination. 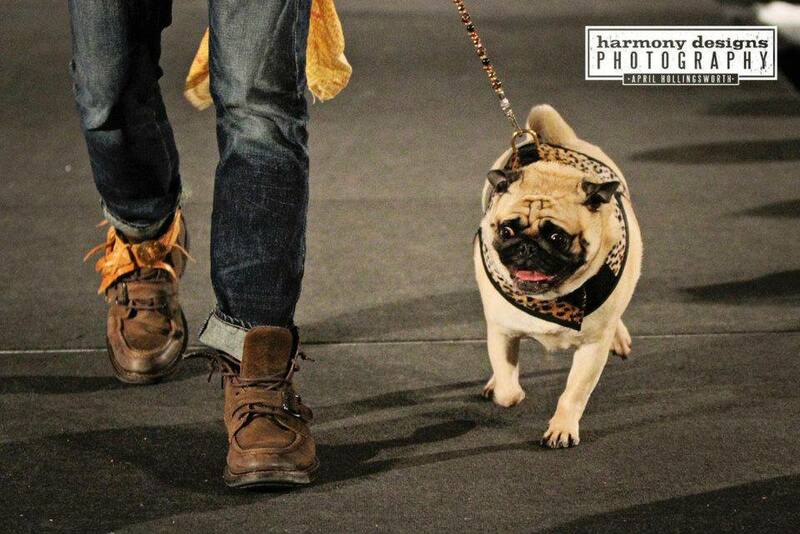 You are one awesome Pug! Aren’t they cute?? 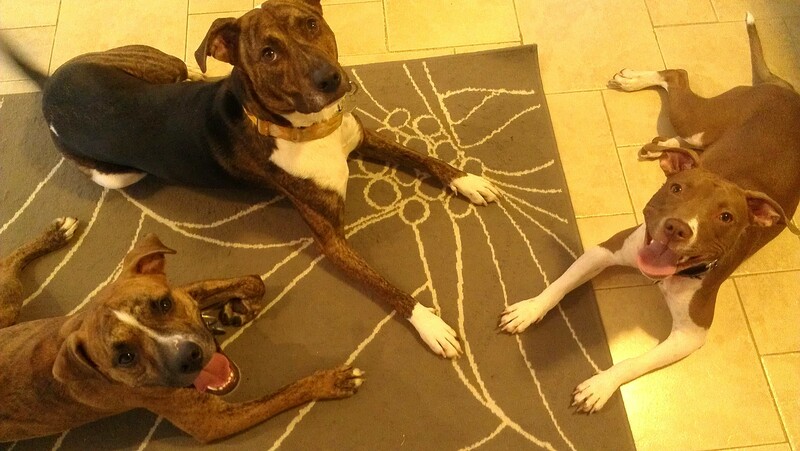 These three lovely ladies are new additions to our friends Mike, Ashley & Libby’s family. 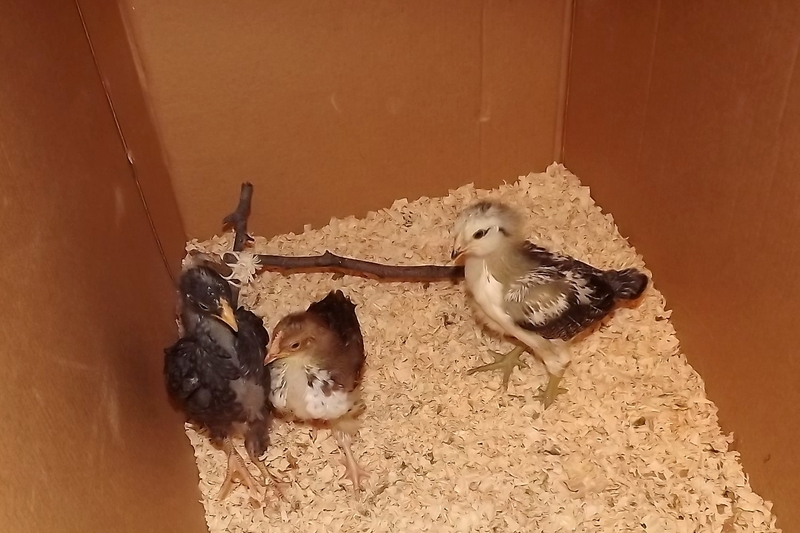 While Mike and Ashley were out-of-town, Libby brought her new three chick siblings to visit us at Foster House for the weekend. Last year, Nashville passed an ordinance to allow keeping urban chickens. As much as I love the idea of raising our own food, our backyard is just too tiny to hold a chicken coop. Not to mention with foster dogs coming and going, we might end up going through chickens faster than we went through eggs. (Eeesh) But with a huge back yard and a very well behaved pooch, Mike and Ashley jumped at the chance for fresh eggs. For now, these three little nuggets (see-what-i-did-there?) 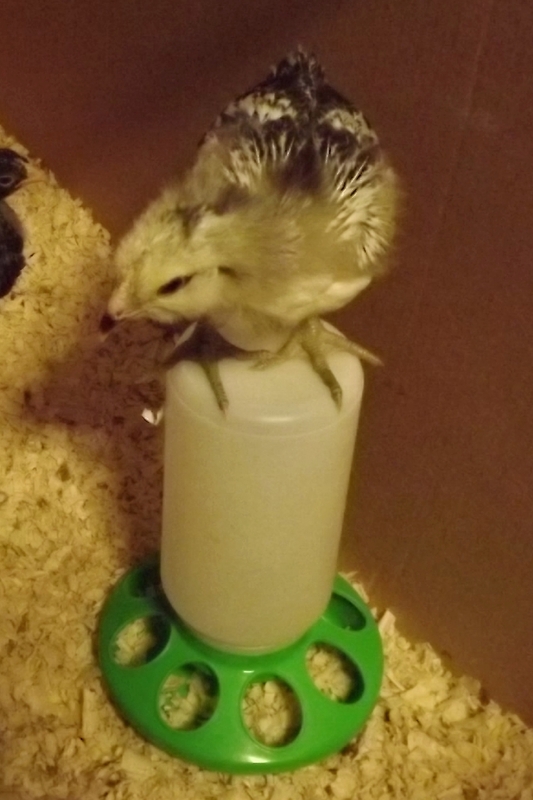 live in this cardboard box, but Ashley is hoping that the weather in Nashville starts cooperating soon so they can move out into their coop,* and then hurry up and start producing yummy fresh eggs. Does anyone else have experience with rasing hens? Do you have any advice for Mike and Ashley? And, probably most importantly, what should they name their gals? Any ideas? 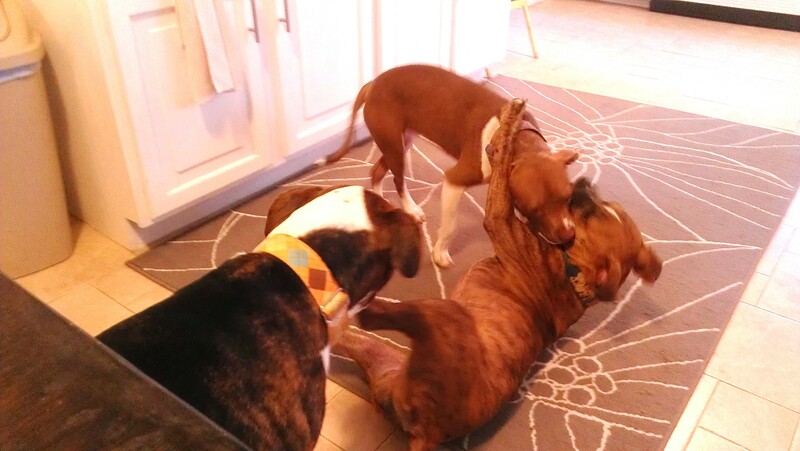 Ain’t No Party Like a Pittie Posse Party! 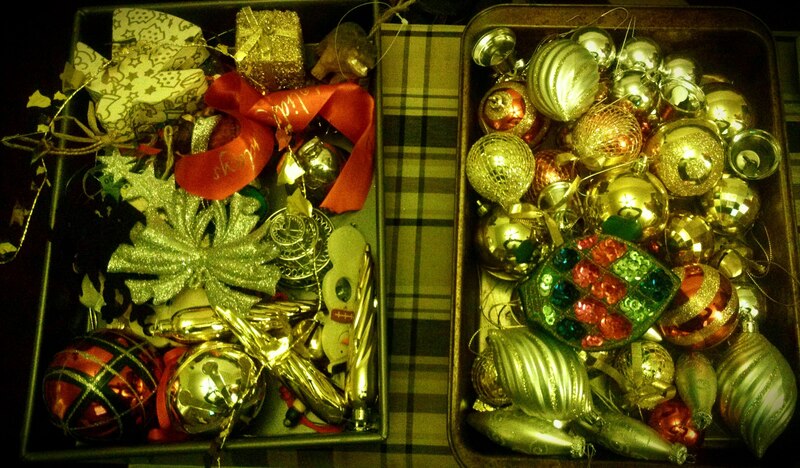 I make it a personal quest to try as hard as I can not to think about Christmas until after Thanksgiving. As much as I love the holiday, I find it harder and harder to love it the earlier I start seeing Christmas decorations in stores. However, now that Thanksgiving has past, it’s go time – bring on the holiday cheer! 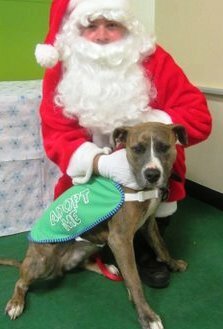 Kaylee visited Santa last year to ask for a family of her very own. And her Christmas wish was granted! Last year, Emily over at Our Waldo Bungie put together a Secret Santa gift exchange with a handful of friends from the blogosphere who also foster dogs and have a love for pit bulls. 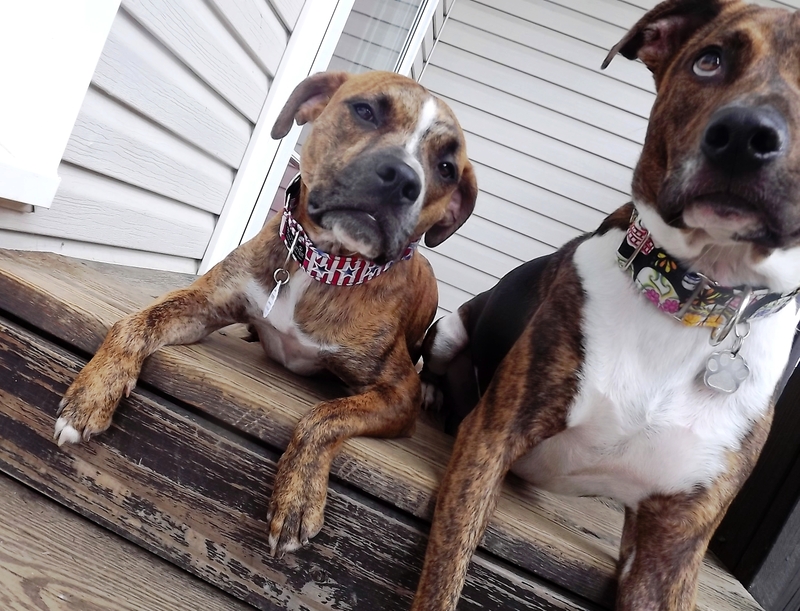 They called themselves the Pittie Posse, and I had such a blast last year reading about all of the thoughtful gifts they exchanged. Guess what? 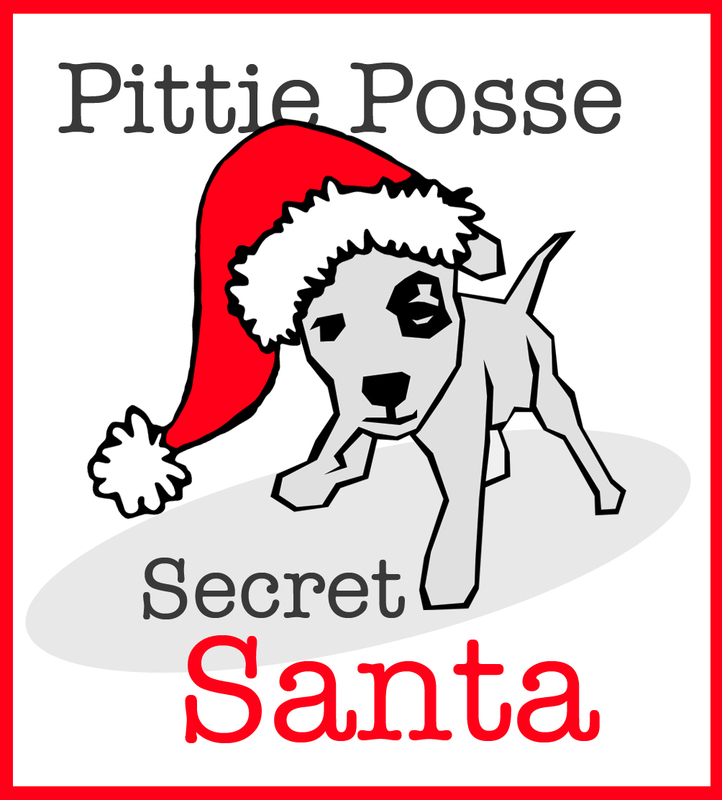 This year they’ve expanded – I’m so honored to have been invited to participate in the 2012 Pittie Posse Secret Santa gift exchange! Also joining the Pittie Posse this year are Peace, Love & Fostering and Two Kitties One Pittie. Man oh man, am I excited….I. Freakin’. Love. Secret Santas! I don’t know how I am going to wait until reveal day…which, by the way, will be Friday, December 21st. In the meantime, we’ve been preparing Foster House for Cooper’s first Christmas. Since he has a certain, um, shall we say “destructive history,” we’re not sure how he’s going to react to all the decorations, not to mention a giant tree right in the middle of the room. So we’ve been slowly trying to introduce the idea to him, by bringing in a bunch of tree trimmings we scavenged from our local Christmas tree shop and placing them on the floor where the tree will go. So far, so good – he doesn’t seem to care much about them. Just to be safe though, I spent the last day of my Thanksgiving break sorting through our holiday decor, picking out the “Cooper-proof” ones. In other words, the ones that I won’t be heartbroken if they get eaten, broken, or otherwise destroyed. We’ll let you know how it goes! Cooper would love a furever home of his very own for the holidays! If you’re interested in adding Cooper to your family, please fill out an adoption application with Agape Animal Rescue. Oscar’s buddy Dexter recently became a big brother! 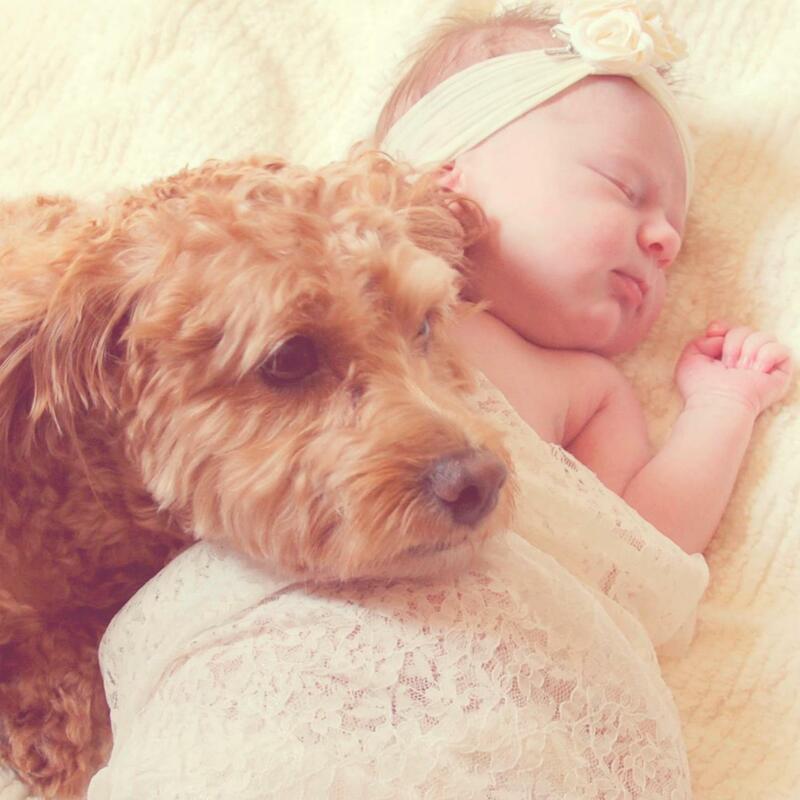 Once they brought their little baby girl home, Mom reports that Dexter has been very protective. Every time she cries, Dexter runs to Mom and back to the baby, as if letting her know, “Momma, she’s crying! Hurry!” Welcome to the world, little lady! Your parents can watch you grow up not having to worry about a thing, because you have a very attentive big brother watching over you. Oh hey, don’t forget to VOTE for COOPER! What, you want to adopt him? You can do that by starting here! What is about someone else’s backyard that is sooooo much more fun than your own? All Oscar and Cooper do in their own backyard is conduct their business then hang out on the porch gossiping like two grumpy old men. 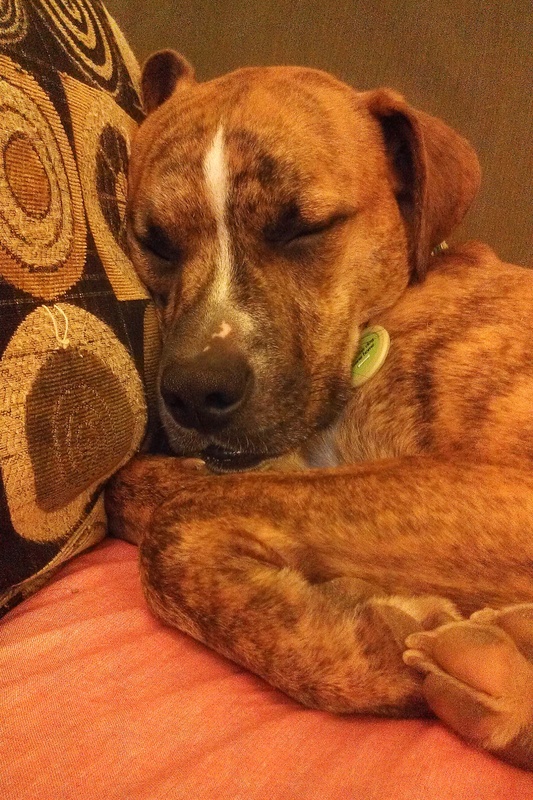 Cooper is still searching for his furever home! If you’ve got enough love to share with Cooper, please fill out an adoption application with Agape Animal Rescue. 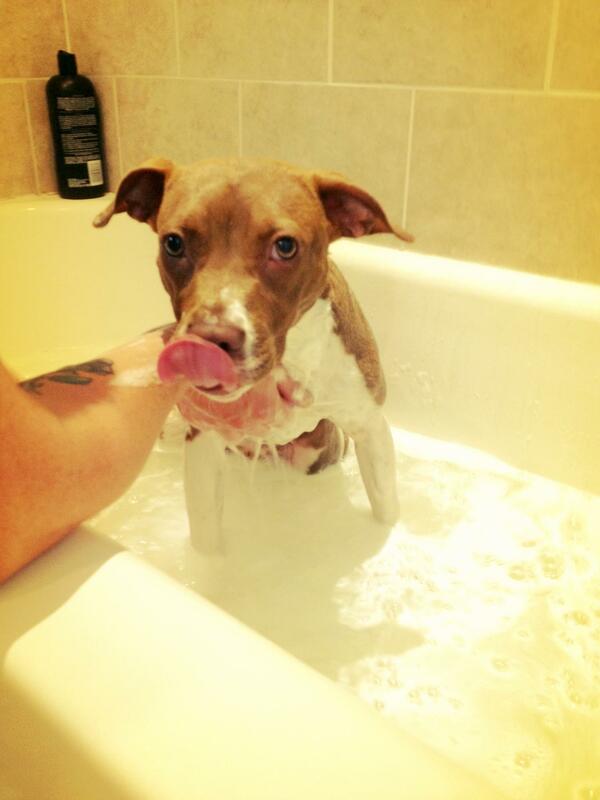 …and don’t forget to VOTE FOR COOPER! Guess who’s still up for adoption? 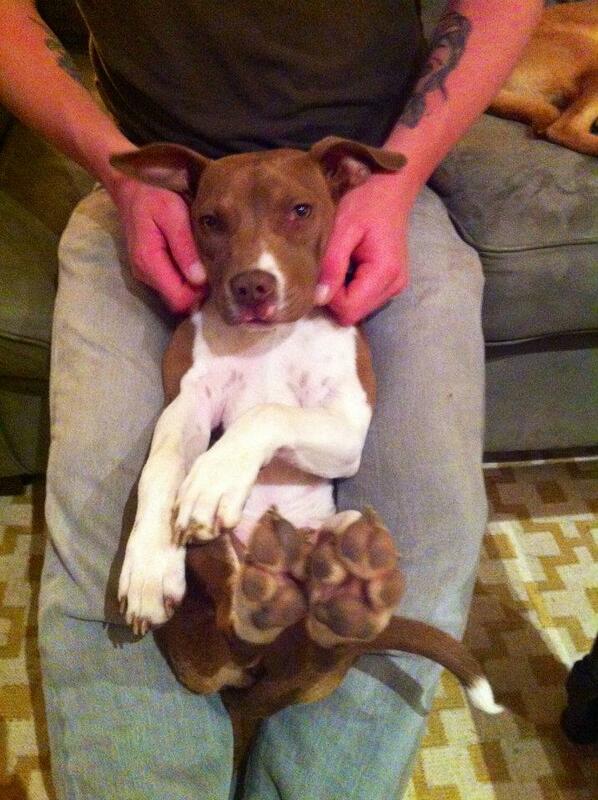 Sweet little Olive, rescued and fostered by my good friend and neighbor (and fellow blogger), Jen. 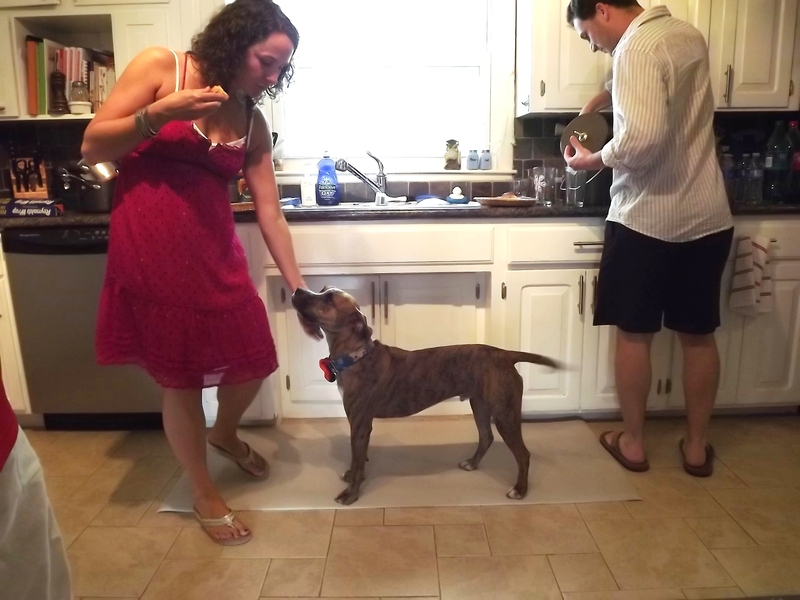 Jen and her husband Jason are first time foster parents who just couldn’t look the other way when they saw Olive suffering at the end of a short chain, tied out in the heat with no food or water. The other day I bribed Jen with cocktails Jen was kind enough to lend us Olive’s services, so we could practice “Look at That” with Cooper. We met at a nearby park where Jen and Olive hung out and practiced Sit’s and Down’s and leash skills, while across the way Cooper worked on not going bananas while Olive was in view. I gotta say, he did amazingly well. 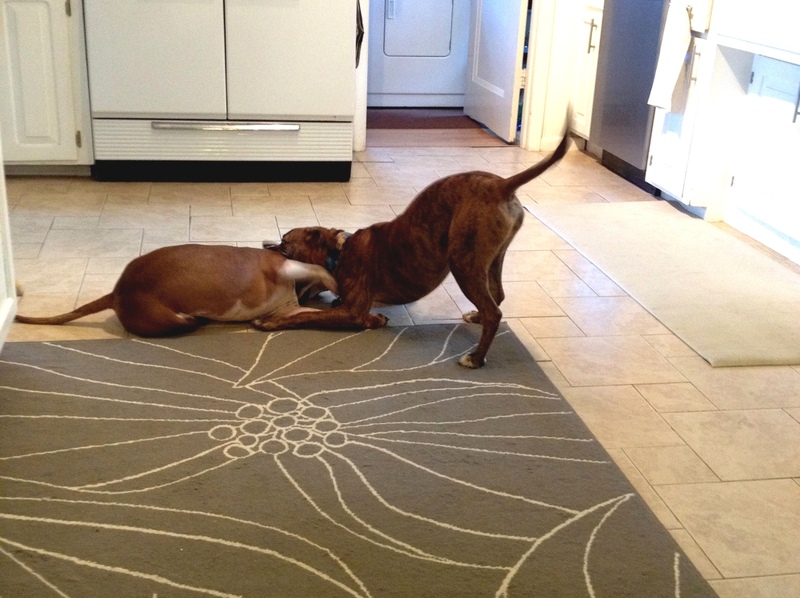 As a reward for their hard work, we brought Olive back to Foster House for a play date. 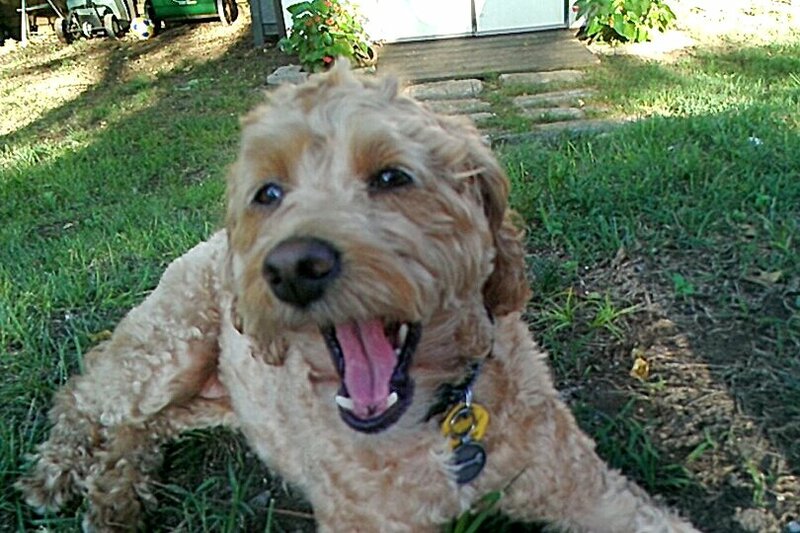 Cooper was ecstatic to have a puppy to play with again, and Olive was totally jazzed to make some new friends. This is the weird thing about Cooper’s nerves – they completely disappear with his leash. As soon as we unclipped his leash and turned him loose with Olive (under strict supervision, of course) his fears evaporated and he pounced on her with a play bow, wiggly waggy tail, and classic Cooper smile. I’m sure the fact that we were “on his own turf” may have had something to do with it, but it does give me hope that, with time and continued practice, we’ll be able to overcome his fears completely. Do you need some puppy love in your life? If you’d like to add Olive (or Cooper!) to your family, please fill out an application with Agape Animal Rescue. Last weekend, about a dozen Agape Animal Rescue foster parents gathered at Foster House to share food and war dog stories. Agape holds these Foster Socials every few months, and it’s a great time to get together to share training tips, adoption stories, and everything in between with like-minded dog lovers. Oscar was, as predicted, a gracious host, and Cooper even dressed up for the occasion. We’ve talked about Cooper’s anxiety around other dogs, but it hadn’t occurred to us that this would be Cooper’s first time in a house full of people. Not just people, but strangers who he hadn’t met before. We weren’t quite sure how he would react. Fortunately, after some initial nervousness, he calmed down and realized that more people in the house = more attention! Unfortunately for him though, it did not mean People Food for Cooper. 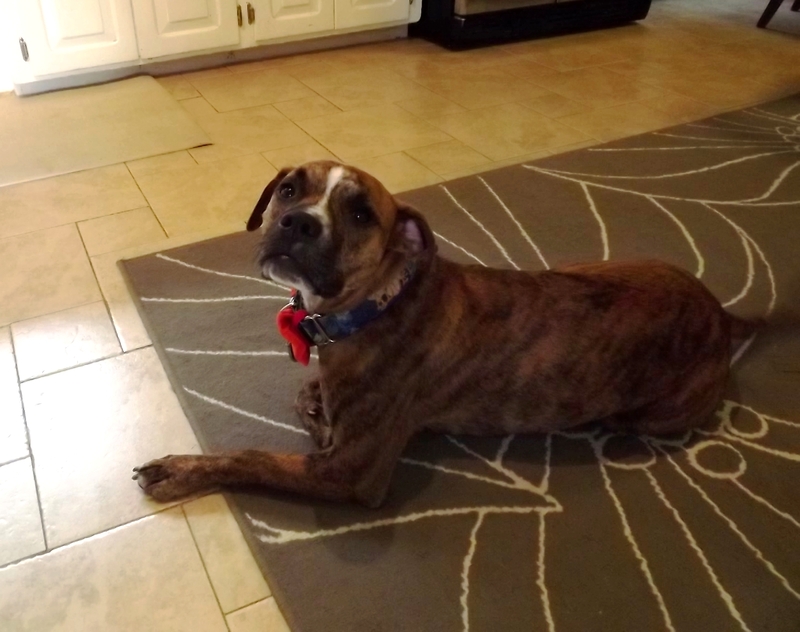 This was a great thing about having a bunch of dog people in our home, who all understand how important it is to respect House Rules – no matter how heartbreakingly adorable Cooper’s “please feed me” face is! If you’re interested in adding Cooper to your family, please fill out an application with Agape Animal Rescue. New Year, New Medical Emergencies! Can't wait for more HBAMF? Get new posts delivered right to your inbox! 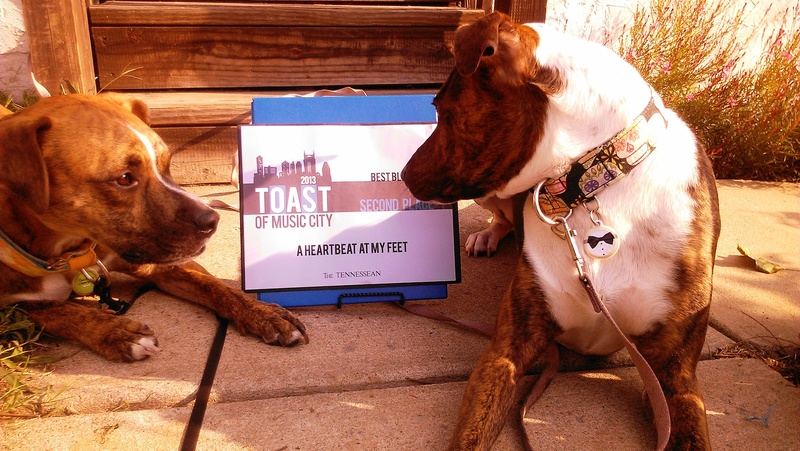 A Heartbeat at My Feet · Opening our minds, hearts and home to the dogs that need us most.